WEDU's Community Cinema takes Sea Level Rise out of the headlines and makes it personal. President Mohamed Nasheed of the Maldives is a man with a bigger problem than any other world leader has ever faced — the literal survival of his country and everyone in it. 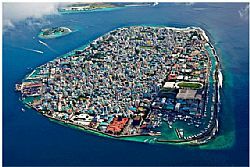 After bringing democracy to the Maldives, he must now ensure that his tiny country doesn’t disappear under rising sea-levels. RSVP: Free, but seating is limited.